Now that January 2019 has come to an end, and a New Moon, Feb. 4-5, is around the corner, how about making some new intentions to show up differently? Whether or not you made any New Year's resolutions, the New Moon is an ideal time to focus on what you want to bring in to your life. What would your life look like if you had more of whatever it is you could use more of....more energy, vitality, joy, happiness, peace, financial flow, social connections, creative expression? How about joining me on a challenge? For one entire week, let's show up differently. Let's wake up, look in the mirror, and focus on what we are grateful for ~ our inner brilliance ~ rather than our 'flaws.' Let's acknowledge what we are doing well, rather than what is missing, or our seeming mistakes. Let's choose to let the most illuminated versions of ourselves emerge ~ every day, for at least one week. Throughout the day, if we find ourselves losing patience ~ whether in traffic, at work, at home, or in line at a store, let's remind ourselves that we chose to show up differently. We chose to allow the most illuminated versions of ourselves to have the keys to the car, at least for one week. How differently would that look? What if all week we saw everyone in our life through the lens of a loving heart? With greater patience, understanding, or gratitude for their being in our lives, despite any challenges we may be enduring? What if we could expand our loving heart like a beacon of light out into our greater communities? What if when we find ourselves at the cross hairs of hateful rhetoric being spewed, we choose to not engage. To stay grounded. To not let ourselves get hooked in, triggered, or lose our positive mindset. Instead, we chose to remember that intention we set for the day, and at least for one week, to show up differently. Envision everyone you know doing this. And everyone they know. How might that change our personal and collective circumstances? I'm choosing to show up, be happy and enthused about my life, and remind myself to maintain that awareness, and commit to that choice for the entire day, and for an entire week. I am not a fake cheerleader type. I struggle with just 'choosing to be happy' as I don't actually consider having other emotions to mean I am not happy. And as I said, I don't want to appear phony. I have a desire to awaken after a good night of sleep feeling rejuvenated, and ready for my day. I desire to feel enthused about my life. I instead seem to have a sort of set point, or default setting. I'm always in energy conservation mode ~ as if I'll run out of energy, and I have to ensure there is enough. I often do not sleep well, and I don't exactly wake up bounding out of bed, excited for my day. I mean, I'm not moaning and groaning, but I'm just sort of in between. In fact, I often feel like I'm carrying around this heavy sadness, for which I can only guess at the source. There is a lot of pain in the world, and I seem to tune into it's frequency. I'm highly empathic, so it comes with the territory. However, try as I have to release that aspect of me that holds the pain and sadness of life, she stubbornly clings, and is just part of who I am. I am very spontaneous, and have moments where I feel like my heart suddenly broke open wide, and I experience a great love for all, pure bliss, and joy. I feel connected to Nature, and all that is. It's an incredible, elevated feeling ~ like being wrapped in the coziest blanket imaginable. I'd like to make that a bigger part of my life. Not wait until I'm over come with joy, but actually choose to uplift myself to the realm that joy exists. Open myself like a conduit to allow pure joy to flow through. This is an important time of new beginnings for me. The first half of my life seemed very focused on a lot of growth, letting go of all the baggage, and reclaiming my power and my light. At one point, it felt to me like my light was getting very dim. I've literally reinvented myself, and have emerged from the fires, like the Phoenix rising from the ashes. And now, I'm ready to begin anew. To show up differently. I'm ready to realize my most illuminated life, and I have this urgent feeling driving me forward. I know it is all up to me, to make the choices that will help my life become what I had always imagined it could be. A life filled with joy, enthusiasm, meaning, purpose, and a content, peaceful heart. The only way I can get there, is to begin here and now. Every day this week, I am intending to choose to elevate my moods, maintain that elevated state as much as possible, and choose to live as if I am a happy, enthusiastic person and an inspiration to others. Care to join me? How would you like to show up differently? What does living your most illuminated life look like for you? I discuss this more in the video below. This challenge is all on each of us to follow through. I don't have a group formed, or place to check in, other than below in the comments here, or on the video. But, let's do this. I'll be following up on my Strong Spirit Woman YouTube channel. 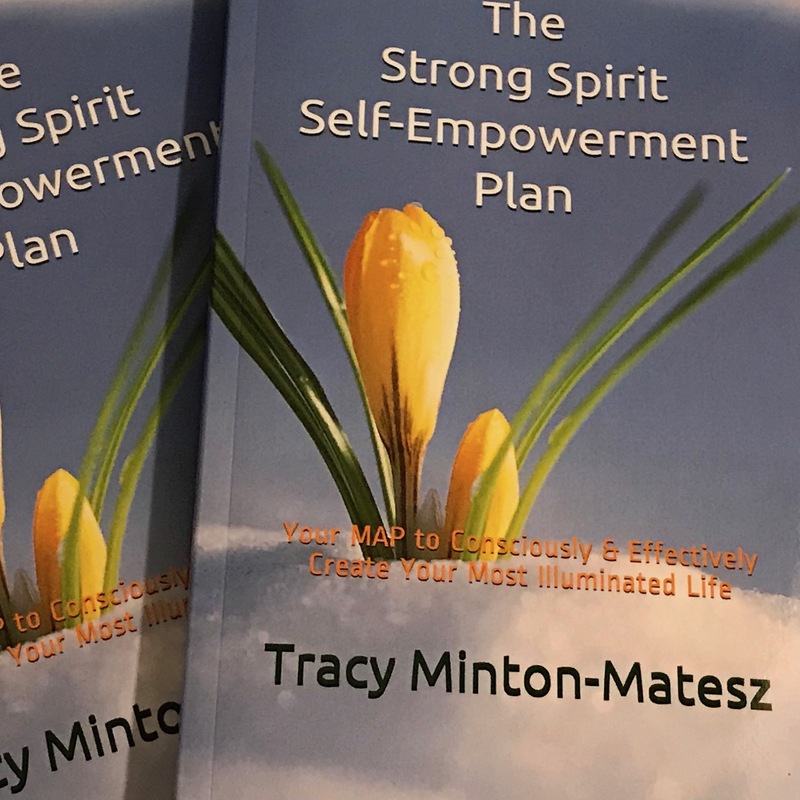 Learn how to get from Point A, where you are, to Point B, where you really desire to be in ten steps, in The Strong Spirit Self-Empowerment Plan, Your MAP to Consciously and Effectively Create Your Most Illuminated Life.